Research suggests that our chronotype (body clock that influences our sleep cycle) has a much bigger impact on us than we thought. In fact, our body clock affects how well we perform on both, mental and physical tasks. According to psychologist Dr. Michael Breus, there are four chronotypes: dolphin, lion, bear and wolf. 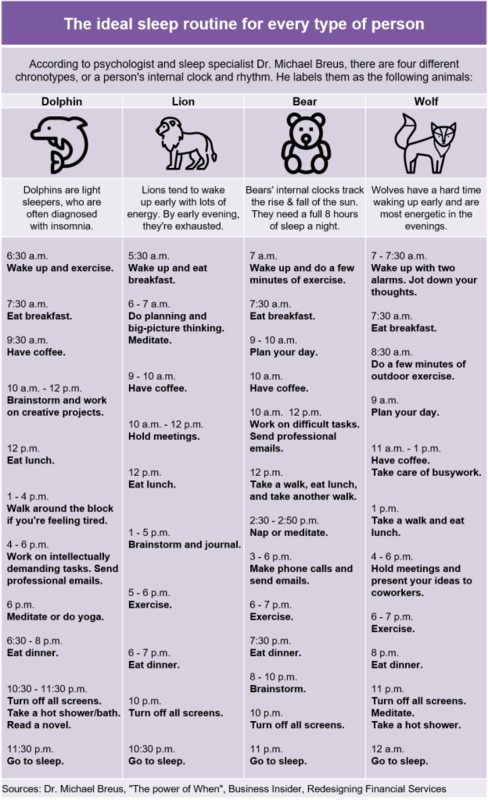 This quiz helps you to find out which chronotype you are and the table below gives you some advice on how to best adapt your daily schedule to your biological rhythm.